Up at Monroe, Brad has been chunking away at tooling for the seat pan parts, the external boss for the pneumatic tailwheel option, and for bulkhead 6 at the aft lift tube. The mold for the external boss for the pneumatic tailwheel option. In addition to this part, there's also an inner fender made of two identical pieces bonded together along the wheel's plane of symmetry. I originally designed the boss and fender as a one-piece part, which turned out to be completely unworkable. This plan that Brad's working out is much easier to make in practice. Three photos of the plug for the knee hump portion of the cockpit floor. The art-deco feature in the middle serves as a boss to mount the instrument pod to, as an anchor for the pedal adjust and tow release cables, as a stiffener for the control stick pivot anchors, and as a platform for the control stick boot. For the initial couple or three examples, this part will be made blind and then get shear-taped into the fuselage. Future iterations will feature a bonding flange that exactly matches the fuselage profile. Two photos of the plug for the lower portion of Bulkhead 6, which goes at the aft lift tube and distributes lift and yaw forces into the fuselage shell. Brad is designing the smaller upper portion that closes the fuselage at the aft end of the turtledeck opening that lets builders install and connect all the mid-fuselage structure and system parts. For some reason the color and shape of this plug reminds me of Han Solo embedded in Carbonite. The Lego version, maybe. 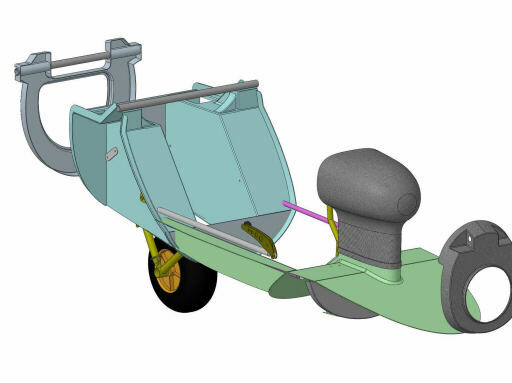 Here's a screen capture of our current forward fuselage structural model, showing bulkheads 2 through 6, the seat pan features, the instrument pod, the gear box parts, and the control stick and gear retract systems. Not shown is the strap that connects the two gear boxes to enclose the landing gear and stiffen the fuselage in that area.